Set your own delivery rates and distance intervals for local customers based on distance from your store / warehouse! Set minimum order amount to offer this local delivery to customers. Do you have your small business? Do you want to offer local delivery for your customers? If YES then Distance Local Delivery module will help you to do this! Set up maximum distance (in KM or Miles) and distance intervals with rates for each interval. 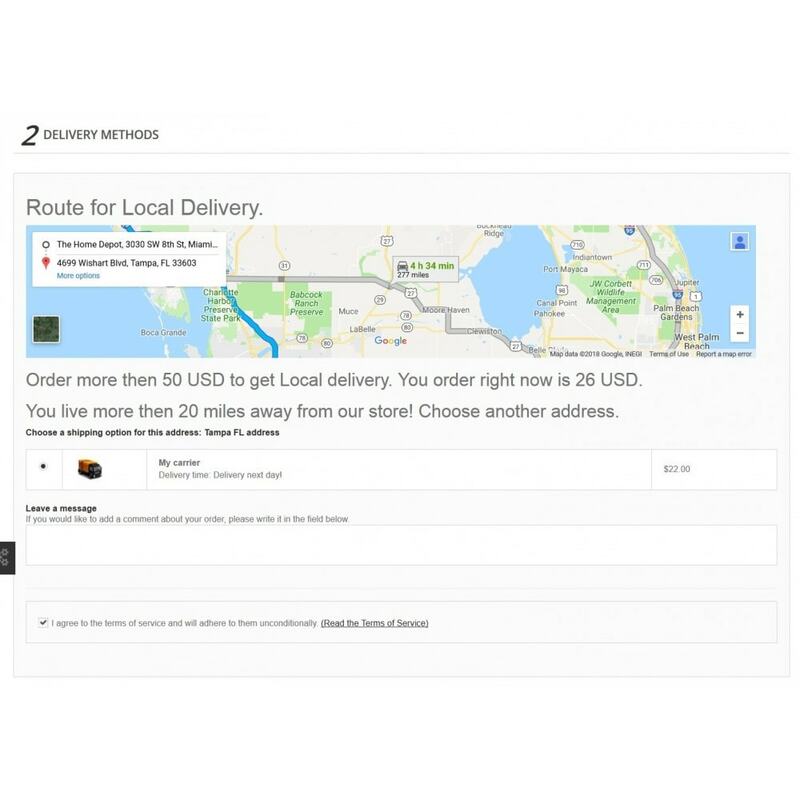 Local delivery shipping option will appear on Checkout Page with cost based on distance. You also could set up minimum order amount for local delivery option. If customer don't meet minimum order amount or max distance then they see message about and Local Delivery is not available. 1. Maximum distance and rate intervals setup. 2. Setup rates for each individual distance interval. 3. Minimum order amount for local delivery option. 5. Choose KM or Miles. 6. Google Map on Checkout Page with route to customer from store. See cost of local delivery.